There are a lot of situations that may cause a person to wonder if breast augmentation is right for them. Are you pregnant? Are you planning on losing a lot of weight? Are you concerned about your age? All of these things can affect the size and shape of your breasts. Whether your breasts are underdeveloped, disproportionate to your body, or different sizes, a breast augmentation surgery or a combination of breast procedures can help. Schedule a free consultation with Dr. Griner and he’ll address all of your concerns and help set expectations for the potential and realistic outcomes. There are a lot of situations that cause women to wonder if a breast augmentation is right for them. Are you pregnant? Are you planning on losing a lot of weight? Are you concerned about your age? All of these things can affect the size and shape of your breast. Whether your breast are underdeveloped, disproportionate to your body or different sizes, a breast augmentation or combination of breast procedures can help. Schedule a free consultation with Dr. Griner and he’ll address all of your concerns and go over realistic outcomes and help you to have the right expectations. Saline Breast Implants are filled with sterile salt water. These implants are often a good choice because they provide the best projection, a uniform shape, firmness, and feel. They are FDA-approved for augmentation in women age 18 years or older. Should the implant ever leak, the implant will collapse, and the saline will be absorbed and naturally expelled by the body. Silicone Breast Implants are filled with a silicone gel which provides a feel more like natural breast tissue. The FDA has approved silicone breast implants for augmentation in women age 22 or older. Unlike a saline implant, a ruptured silicone implant will not collapse. The gel may remain within the implant shell if the implant leaks, or (in older implants) it may escape into the breast implant pocket. Dr. Griner only uses the highest quality cohesive implants that even if the shell were to break, would not leak into your body. The condition of silicone breast implants can be assessed using ultrasound or MRI screening which is recommended by the FDA every 3 years. Gummy Bear Breast Implants are referred to as form-stable implants because they maintain their shape even if the implant shell breaks. They are also firmer than traditional implants and are thought to be less likely to break. Shaped, rather than round, Gummy Bear breast implants have more projection at the bottom and are tapered towards the top. Please note: if a shaped implant rotates, it could lead to an unusual appearance of the breast, and the procedure requires a longer incision in the skin to place them correctly. Round Breast Implants are more likely to make breasts appear fuller than form-stable implants. Even more, a projection can be achieved with higher-profile options. There is less cause for concern about these implants rotating out of place because they are round all over. Smooth Breast Implants feel the softest but may have some palpable or visible rippling. However, since they can move with the breast implant pocket, they may give more natural movement. Textured Breast Implants are less likely to reposition or move around inside of the breast because the scar tissue that develops will stick to the implant. While texturing offers some advantage in minimizing the risk of a tight scar capsule, Dr. Griner does not use these due to the association discovered between textured implants and Anaplastic Large Cell Lymphoma (BIA-ALCL). 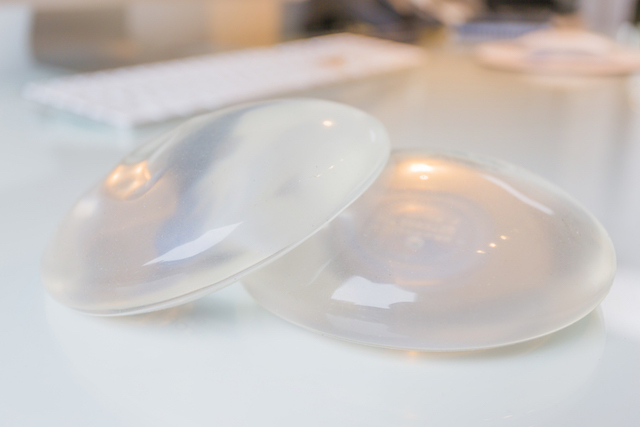 Whatever shape you choose, it is important for you to monitor your breast implants with follow-up visits with Dr. Griner. Be sure to consult with your physician regarding what you should do before coming in for surgery. All important decisions will have already been made, you’ll just need to follow their instructions for maximum comfort and success. Although some may choose to stay overnight, breast augmentation is usually an outpatient procedure. The surgery will last one to two hours, and you’ll likely be given a general anesthesia. Your return home should be well planned so you can rest and recover without requiring any activity. Breast augmentation surgery once required a significant amount of recovery time, but patients now are often able to return to work in a very short time after the operation. For the first 48 hours after the operation, though, you may want to sleep upright (a recliner would be useful for this). You can help reduce swelling by limiting strenuous activity (including exercise and heavy lifting) for 2 or 3 weeks after surgery. Most people will be able to return to normal levels of activity after 4 – 6 weeks. Will I still be able to breast feed? Breastfeeding after the procedure is absolutely possible. However, the condition of the breast prior to breast surgery is an important factor in determining how much milk a mother can make after the procedure. If you are planning to have children and breastfeed after your surgery, be sure to consult with the doctor to choose the best options for you. How long will it take to recover from my breast augmentation surgery? Recovery from the surgery normally requires about 4 to 6 weeks. The placement of the implant will affect this time. Implants under the muscle through the subpectoral dual plane usually take several weeks longer to heal than placing an implant either in the retromammary or subglandular plane above the muscle. How often do I need to replace my breast implants? Although silicone implants are designed to last a lifetime, saline implants have a natural tendency to begin to deflate after seven years. This is due to the “fill port” which can degrade over time. The FDA findings indicate that within 10 years of the original surgery, about 20% of women will have their breast implants repaired or replaced. Every breast augmentation patient will heal at a slightly different pace, but most are able to go for a run, swim laps, ride a horse and generally resume normal exercise routines after about 6 weeks.